I wanted to propose an idea which will highlight how society currently views their bodies. Since writing my essay I have become more passionate than I already was beforehand, pushing me to deliver something exciting, truthful, passionate and honest as a response to the practical element. I initially came up with the idea of producing a series of books or posters, with people with and without eating disorders, holding a sign with a comment reflecting how they perceive their own body image. This proposition however posed two problems when addressed with the females of the class, as this was originally my focus - females. 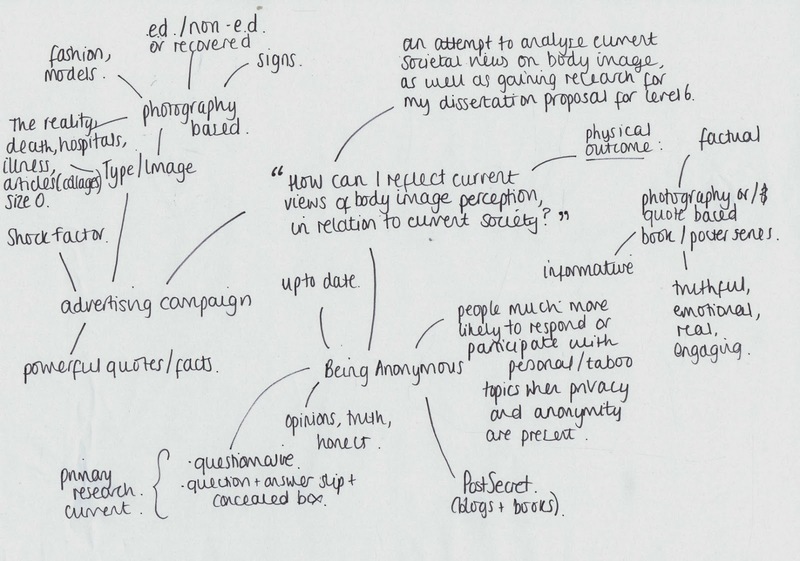 This idea is similar to the project previously researched by Gillian Wearing. The two problems that arose were, people were uncomfortable with revealing their bodies and physique in front of the camera and being published/shown. However some people were up for doing and could still participate with the newest proposal. The second problem which arose how easy it would be to photographic those with mental illnesses. This idea has been left for the time being and will be re-worked and re-considered for my dissertation proposal as this is a theme I would like to run forward with whilst I have the opportunity. 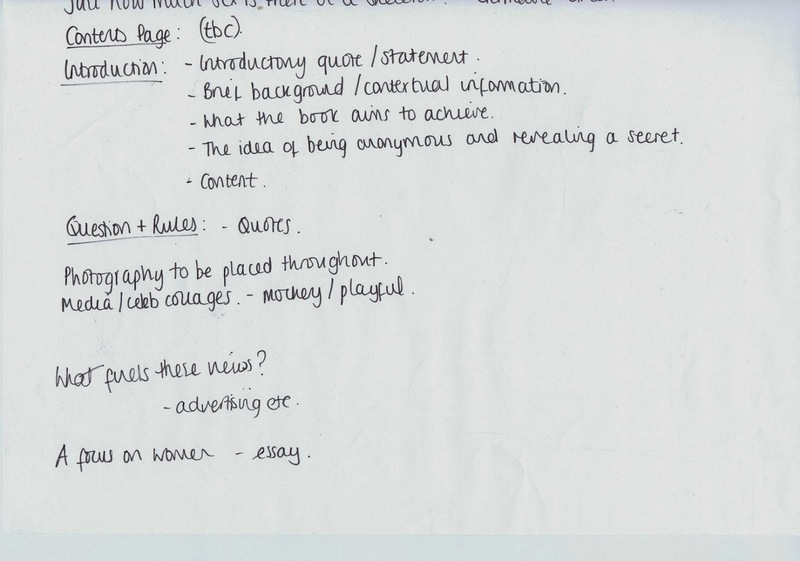 The revised idea, is to publish a one question anonymous survey, asking how people perceive their own body image. The idea of anonymity encourages people to be open, confident and truthful with what they say and reveal. This is similar to the idea of PostSecret. Information on PostSecret can be seen in my previous blog posts. The idea of asking one question only allows as much information or as little to be revealed by the respondent. I am collecting primary research of how people view their bodies at a time where society puts so much pressure on us to conform to an ideal. The research will then be collated into a factual, informative and photography based coffee table/research book, for those interested in the issue, as well as trying to show a real view of a small portion of society in relation to how society sees us and tells us to be. Are we conforming? Do we care? Why do we care? This is what I am hoping will arise from this research based publication project I am very excited about! Below shows the basic structure and contents of the book at this moment in time.